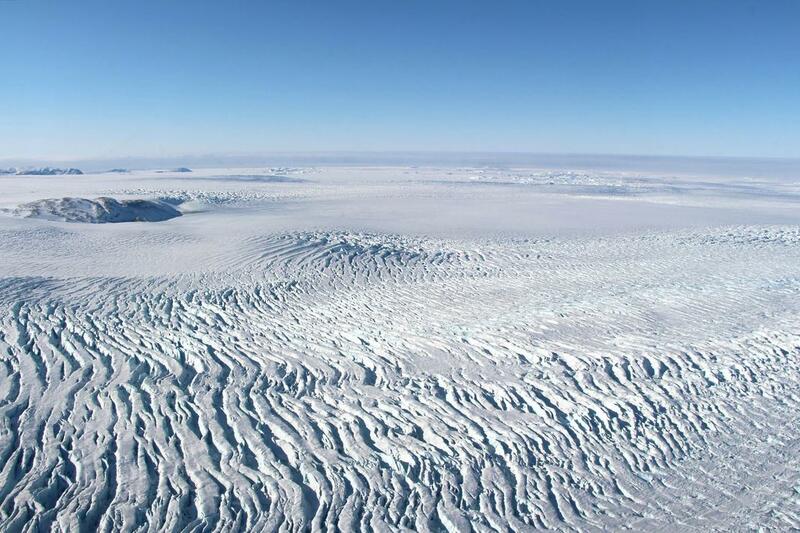 Crevasses on Greenland glaciers are evidence of the increasing rate of ice melt. 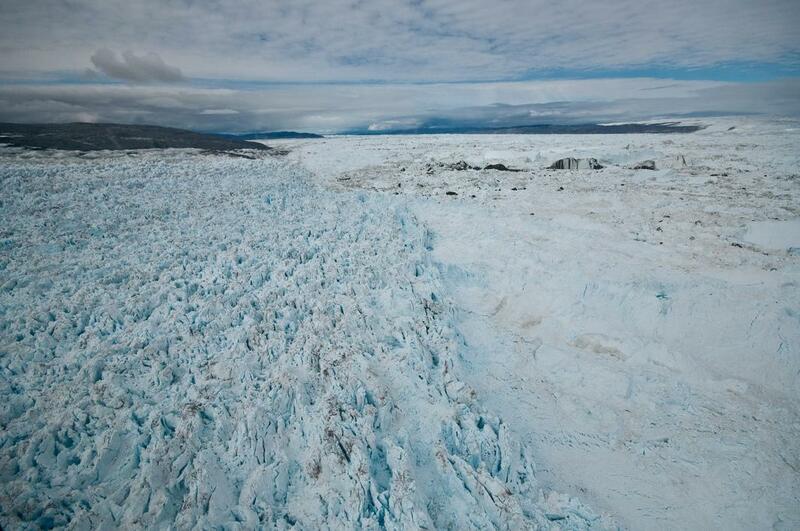 Greenland’s glaciers are racing to the sea at ever faster rates, causing them to stretch out. 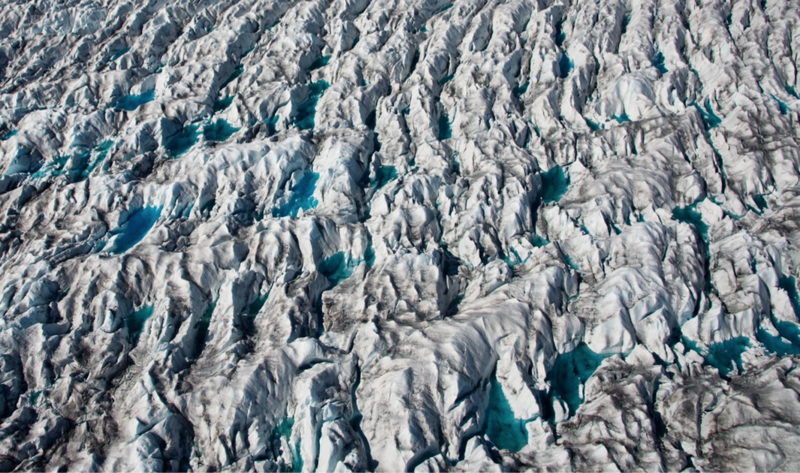 Here, a field of crevasses on the Qassimiut lobe in southern Greenland. The evidence is overwhelming: Earth’s polar regions are losing ice at a stunning rate. There’s so much ice being lost from Antarctica, for example, that scientists can detect local changes in gravity. To measure the changes, NASA launched Operation IceBridge, an initiative to map the planet’s dwindling ice sheets by aircraft in three dimensions. Now in its eighth year, Operation IceBridge is starting to produce some stunning results. The IceBridge planes are equipped with lasers and other remote sensing equipment that can virtually tunnel through the ice and make accurate measurements of its thickness. Heavy crevassing near the coast of Melville Bay in west Greenland. These cracks are essentially stretch marks on the ice. They occur here because the ice is accelerating as it flows toward the coast. A close-up of the crevasses on the Qajuutaap glacier in south Greenland. This view shows the transition to smaller crevasses in the region of the ice sheet feeding into Jakobshavn Isbrae. The large crevasses in the foreground are outside the fast-moving trunk of the south branch (area toward the upper left), but are still in a region that is flowing at several hundred meters(yards)/year. The speed of the south branch the glacier increases rapidly along flow toward its front, producing strong “stretching” that creates this heavily crevassed area. This view looking down fjord shows the heavily crevassed terminus of the south branch. 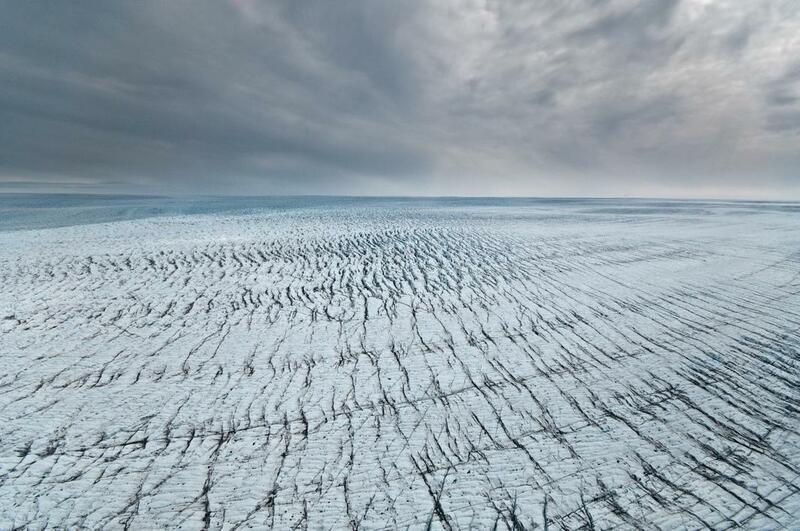 Forming crevasses is a natural part of a glacier’s life cycle—just before it breaks apart into countless icebergs once it reaches the ocean. 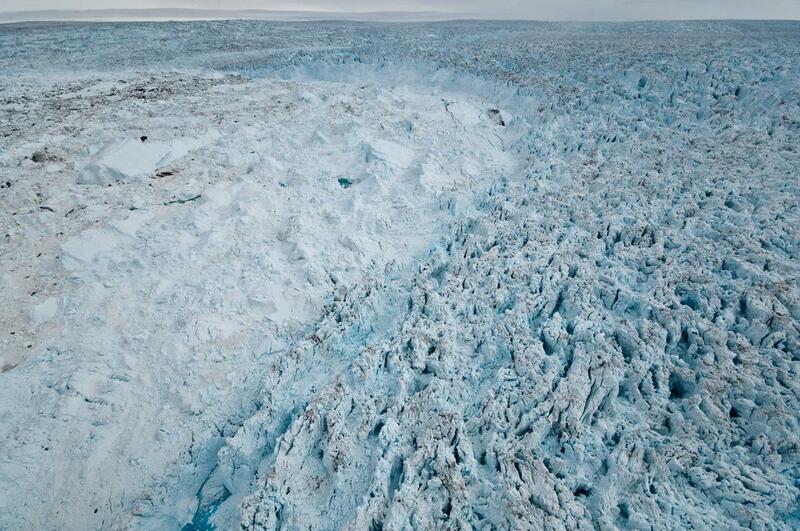 But there’s theory and evidence that crevasses in Greenland are becoming more common with rising temperatures. “As glaciers accelerate, they should stretch more and produce more crevasses. 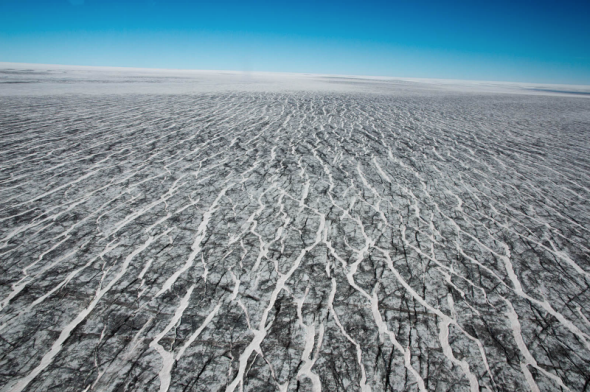 In relative terms, any increase in area [covered with crevasses] is pretty small (i.e., a fraction of a percent of the area of the ice sheet),” said University of Washington polar scientist Ian Joughin in an email. Operation IceBridge scientist Michael Studinger told me that since the aircraft can’t measure glacier speed directly (that’s best done from satellites), the team members often use crevasses as a proxy speedometer. So while the crevasses may be beautiful, they’re an ominous sign. Greenland’s fastest glacier, Jakobshavn Isbrae, is now moving four times as fast as it was 20 years ago during the summertime. A recent survey of all Greenland glaciers shows an increase in speed by about 30 percent in the last 10 years. Of course, all this ice has to go somewhere. 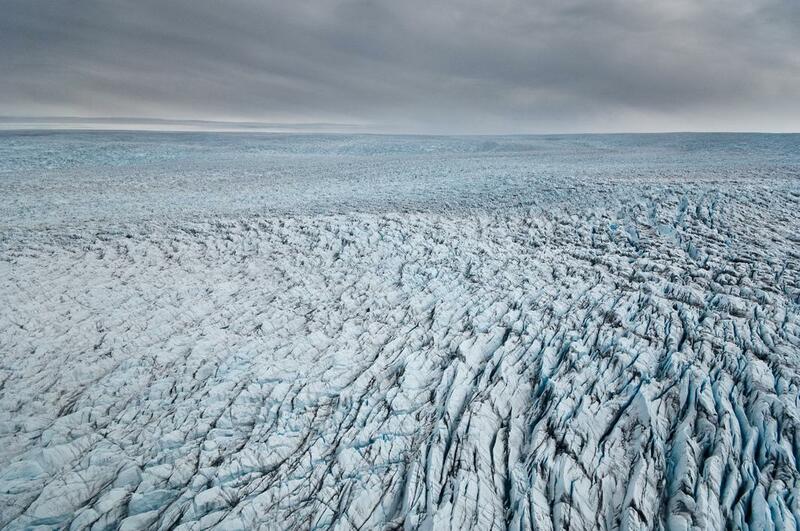 Ice melt is one reason sea level rise is accelerating along with the speed of the glaciers. Joughin was part of a team of researchers who last year concluded a key glacier in West Antarctica had entered a state of “irreversible collapse” that has essentially locked in centuries of sea level rise. That study used data from Operation IceBridge.